In Michigan, we get more than half of our electricity from coal and all of that coal is imported from other states. Soon, you’ll be asked whether you want more of our electricity to come from sources like the wind and the sun. Proposal 3 will ask voters to amend the state Constitution to require utilities to get 25 percent of their electricity sales from renewable sources (the proposal defines these sources as wind, solar, biomass and hydropower) by the year 2025. It’s called a renewable portfolio standard. We already have one on the books: it’s a 10 percent standard utilities have to meet by 2015. Eric Lupher is with the Citizens Research Council of Michigan. It’s a nonpartisan, nonprofit group that has analyzed the Michigan ballot proposals. But he says there could be drawbacks. He questions whether we should put energy policy in the state Constitution. Renewable energy is a field that is dynamic in terms of the ability to generate electricity from different types of energies, the technologies for generating that energy, and the ability to balance energy produced by non-renewable sources with renewable energy. Adoption of this amendment would provide some leeway to adapt to changing circumstances, but a future constitutional amendment(s) may be necessary to allow electric utilities to keep current in renewable energy usage to comply with state law. Michigan does not have any other provisions in its Constitution that compel persons or businesses to engage in activities or perform tasks. The 1963 Michigan Constitution, even after being amended many times in its 49 year history, defines and limits the basic organs of power, states general principles, and declares the rights of the people. Even for the governmental types provided for in the Constitution – the state government, counties, townships, school districts, universities – the provisions define powers, establish officers, and enable boundary changes. The constitution does not compel any of those governments to perform an activity. The proactive requirements in Proposal 2012-03 requiring changes in behavior and investment in a particular manner for private entities – albeit regulated utilities – would be unique to the Michigan Constitution. Lupher points out the cost of electricity is likely to go up whether or not Proposal 3 passes. That’s one of the biggest debates between the two campaigns: how much this will cost. Both sides agree we’d have to build more wind turbines to meet the standard. Steven Transeth is a senior policy advisor with CARE for Michigan. It’s the group leading the effort to defeat the proposal. He says his campaign estimates that would mean each ratepayer in Michigan would pay about $2500 over 20 years. But supporters of the proposal say those costs are overblown. James Clift is with the Michigan Environmental Council. He says the cost of implementing Proposal 3 would be closer to $10 billion. And he says… the opposition campaign lumps businesses and residential ratepayers together. His group spreads that one thousand dollars over 25 years… and subtracts out fuel savings from burning less coal… and assumes we won’t have to upgrade some old coal plants. They come up with an average cost of 50 cents per household per month. As you can tell, the two campaigns use different assumptions and come up with much different price tags. Liz Moyer is an assistant professor at the University of Chicago. She’s the co-director of the university’s Center for Robust Decision-making in Climate and Energy Policy. She analyzed Proposal 3 in a new report at the request of University of Michigan faculty. She says Proposal 3 is likely to have a moderate financial impact on consumers. She says at the most… if you pay $100 a month right now… by 2025 your bill could go up to $111 dollars to meet the new standard. But she points out there’s a rate cap in the proposal that limits cost increases related to compliance with the renewable standard to one percent a year, so that portion of your bill would go up slowly. 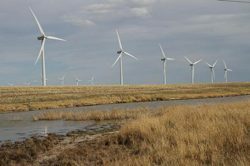 Analysis of wind resources suggests that the proposed expansion of Michigan’s renewable portfolio standard to require that 25% of the state’s electricity sales derive from renewables (Proposal 3 on the 2012 ballot) can be met by its 2025 target date with a moderate direct financial impact on the consumer. Impacts on average Michigan electricity rates could be from 3.5-11% depending on the continuation of federal subsidies and details of implementation. Proposal 3 does allow the option of wind generation in some out-of-state areas with significantly higher windspeeds and therefore lower costs than in Michigan. Responsibility for balancing local interests vs. costs is left unclear in the statute and would likely be placed on the Michigan Public Service Commission (MPSC). Moyer says the bottom line is: whether you’re willing to pay more for more renewable energy. On Thursday’s Environment Report, we’ll take a look at how we might produce all that renewable energy. I’m Rebecca Williams. The town of Vanderbilt has seen better days. The village bills itself as the gateway to the Pigeon River Country State Forest, a few miles down the road. But the Gateway Restaurant in Vanderbilt closed in 2009. Mainly, Casperson just thinks there are too many environmental rules. that the answer is a global conspiracy. This is commonly referred to as Agenda 21.
stuff like controlling pollution, combating poverty and helping farmers. to connect to ideas in Agenda 21.
introduced legislation meant to outlaw Agenda 21. Agenda 21 that infringe on private property rights. Conservationists say all this is disturbing. Paul Rose is on the board of the Pigeon River Country Advisory Council. He says he didn’t take any of it seriously until he saw the legislation. Rose says talk of a global conspiracy shortcuts debate with fear. Climb the lighthouse tower at the tip of the Old Mission Peninsula — where the two Grand Traverse bays meet … and look out over rocks and exposed bottomlands. The shallow surf dried up years ago and levels on Lake Michigan are now at near-record lows. Both Republican Congressman Dan Benishek and his challenger – former state Representative …and Democrat …Gary McDowell say that concerns them. But in a recent debate – Benishek – who’s a surgeon – said he’s skeptical of claims this has anything to do with climate change. A bi-national report from the International Joint Commission earlier this year listed uncertainties for Great Lakes water levels due to climate change – including reduced ice cover in winter …and more evaporation year-round. It also says local rainfall may mitigate those effects in lakes Michigan and Huron. Benishek thinks the bigger concern is that dredging near the southern end of Lake Huron in the middle of last century has lead to water losses for both lakes. A U.S. Army Corps of Engineers spokesman in Detroit says… there have also been times of record high water levels since that last dredging. In debate, Gary McDowell responded – it’s crazy to ignore the science behind global climate change. The candidates in this race are not leaving the negative messaging to outside interest groups. Benishek has criticized McDowell on his business record. The McDowell campaign has repeatedly criticized Benishek for his environmental voting record. Benishek did vote to amend clean water laws – to restrict federal regulators from imposing new standards … unless the states approve. Likewise – he did vote to repeal emissions standards for cement manufacturers. But Benishek says – these were not votes cast to allow more pollution … but to end what he calls “job-killing” federal regulations. Thoughtful decisions – he says – that shouldn’t be reduced to soundbites. Benishek says – as the state with the most fresh water shoreline in the basin – Michigan is best poised to set its own standards. Benishek and McDowell agree on this: whoever takes the seat in January will represent the congressional district with the most freshwater shoreline in the country… and a place where recreation and tourism are not just fun and games. 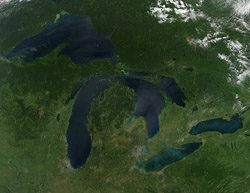 A new project is going to try to predict the future of the Great Lakes. It’s appropriately named: the Great Lakes Futures Project. It’s a collaboration of 21 universities from the U.S. and Canada. Don Scavia is the director of the Graham Sustainability Institute at the University of Michigan. He’s one of four project leaders. He says students will team up with a counterpart from the other country, along with a faculty mentor. The teams will develop white papers outlining the biggest things driving change in the Great Lakes region. Scavia says climate change is making everything more complicated. Scavia says the university teams will hold a workshop in January. They’ll ask government agencies, industries and environmental groups to join them. And the group will talk about the best ways to manage the Great Lakes in the future. The project will cost about $200,000 dollars. The 21 universities are splitting the bill. Let’s just flip back through the 2012 calendar, shall we? First, there was the winter-that-wasn’t. That’s meteorologist Jeff Masters. He’s based in Ann Arbor and is a big name in the weather-blog world. Weird, unprecedented 80 degree days in early spring, that tricked all our apple blossoms into blooming and killing off that crop. And that was all just a warm up to this summer. Literally. That’s Michigan farmer Jon Drozd speaking to MLive reporters this summer. All of Michigan’s counties were declared disaster areas. Nationally, it was the third most expensive disaster in U.S. history. Plus, it came with some of the hottest days and worst air pollution Detroit has ever seen… and a bumper crop of West Nile virus. If all of this makes you feel uneasy, meteorologist Jeff Masters says he’s hearing that a lot. He says Michigan’s climate has reached a sort of tipping point. Masters says that means more extremes on both ends: massive droughts and frequent storms. So when it comes to extreme weather, 2013 just might give 2012 a run for its money. For the Environment Report, I’m Kate Wells. 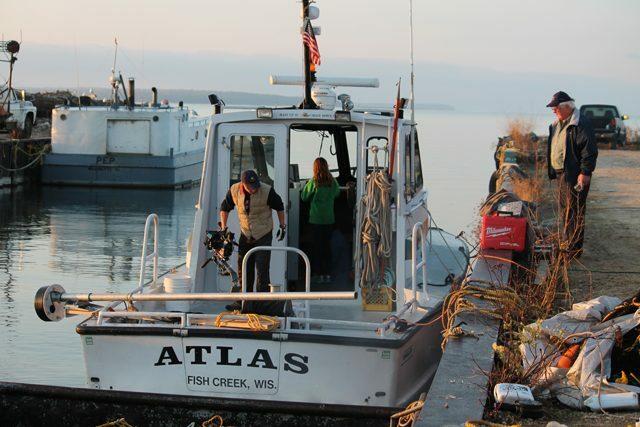 The search for the oldest shipwreck in the Great Lakes has resumed. The team that believes it has found the wreck is moving ahead after closing a legal dispute with the State of Michigan. They’re trying to prove that what they’ve found in Lake Michigan could be a French ship that disappeared in 1679. It’s been thirty years since Great Lakes Exploration began searching for the Griffon. In fact, the original team has been at it so long, they’re running out of time to see it through themselves. Jim Cucharski is one of the original divers on the team. But he’s not in the water today because he recently had a heart attack. In fact, just one of the original divers, Cucharski’s brother Tom, is in good shape for diving this week. The group out of Dayton, Ohio spent countless vacations up here camping and combing the bottom of northern Lake Michigan. Their leader, Steve Libert, lives in Virginia these days. Libert says his interest in the Griffon goes back to junior high. 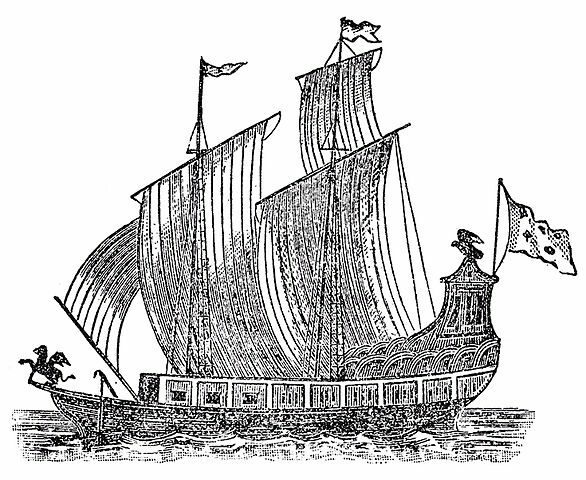 That was when he first heard of the French explorer Robert de La Salle, and his ship with a mythical animal carved on the stern; half lion and half eagle. The location of the Griffon has been the subject of some debate over the centuries. Libert says he was criticized for looking in Lake Michigan by people who thought the wreck was in Lake Huron. That’s because it was said that it went down among the Huron Islands. So Libert’s group searched around the islands off the Garden Peninsula near Green Bay, and in 2001, they found a wooden beam sticking up from the bottom with a few pegs in it. Survey work done since then has started to outline the shape of something buried beneath it: something that is curved like the hull of a boat and close to 20 feet wide, which is the size of the object they’re looking for. So now they are trying to figure how long it is. Mark Holley is a nautical archeologist. 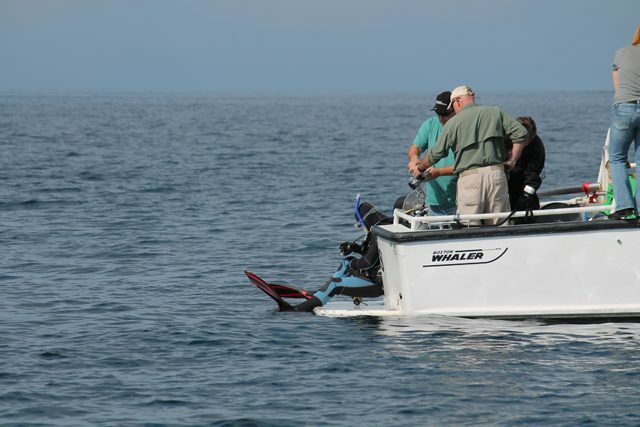 With the device strapped on the back of the boat, they cruise back and forth over the area where they believe the shipwreck is. Once all this information is processed they should have an outline of whatever is down there. The next big step would be to get the shovels out and dig. But that will require a permit from the State of Michigan, and this group has not been on the best of terms with the state. In fact, they’ve fought in court for most of the last 20 years. But Steve Libert is convinced there’s a shipwreck down there and that they’ll soon demonstrate it’s worth a look. But nothing quite like this has ever been done in the Great Lakes. When asked what kind of proof might be sufficient to get a permit to dig, the archeologist on the team said he has no idea. 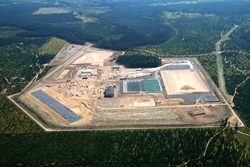 The Eagle Mine near Marquette is under construction. It will be mining mostly nickel and copper along with smaller amounts of other metals. The company Rio Tinto owns the mine. They’ve received their state and federal permits, but those permits are being challenged in court. The mine has been divisive in the community. A lot of people want the mining jobs, and many others are worried about the impacts the mine could have on Lake Superior and nearby rivers. Dan Blondeau is a spokesperson for Rio Tinto. He says the company will be spending about a million dollars on environmental monitoring that’s required by their permits. But he says residents have been telling them that wasn’t enough. Rio Tinto just signed formal agreements with a nonprofit group. The company will pay $300,000 a year for independent testing around the mine area, the mill and certain transportation routes. Dan Blondeau says this kind of agreement is a first for Rio Tinto. The Superior Watershed Partnership is the group that will conduct the testing. Carl Lindquist is the Partnership’s executive director. He says the group was opposed to the mine from the beginning. But once it was clear the mine was going forward, they wanted to be involved as watchdogs. Lindquist says his group’s scientists will be in charge of the testing, and they’ll be using labs approved by the Environmental Protection Agency. They’ll be taking split samples to verify the samples Rio Tinto’s workers take and make sure they’re getting the same results. They’ll also be looking for pollutants in the air, groundwater and surface water. Lindquist says anybody can suggest tests they want to see done. And he says they’ll post all of their data online. He says Rio Tinto will get a chance to comment on any tests that show a chemical is above a state or federal standard. Lindquist says one of his main concerns is making sure the monitoring is kept at arms’ length from the company. He says to do that, the money from Rio Tinto will be handled through the Marquette County Community Foundation. He says they’re also seeking additional funding sources. But others are worried the additional monitoring will not be enough. Michelle Halley is an attorney for the National Wildlife Federation. Her group is suing to challenge the company’s state permits. She says her group is concerned about the type of mining that will take place at Eagle Mine. It’s often called sulfide mining and it can produce sulfuric acid. That can be highly toxic to people and wildlife. The company insists it can mine safely. But there are many people watching what happens. Rio Tinto is one of several companies planning to tap into potentially billions of dollars worth of metals in the Upper Peninsula. Michigan Radio’s Lindsey Smith has been following developments at Palisades. There’s been at least three water leaks at Palisades this summer. Lindsey, remind me which leak this was? Rebecca: It has been fixed, right? Do we know what caused it? Lindsey: “Yeah, the leak has been fixed and Palisades is operating. We know that the leak was coming from a tiny hole in one of the reactor’s control rod drive mechanism. Plant operators can move these control rods in or out of the reactor vessel to control the rate of the reaction. But we still don’t know what the root cause of the hole was. During a briefing Monday afternoon, NRC branch chief Jack Giessner noted that there was a similar leak from the control rod drive mechanisms – he calls them CRDMs – in the past. Rebecca: What else did Giessner say about the leak? Lindsey: “He estimates that up to 10,000 gallons of water leaked from the reactor vessel over 33 days. He says the radioactive water was contained in the building and then processed like normal radioactive liquid and there were no safety concerns for the public. Rebecca: So what’s the bottom line here? Lindsey: “The bottom line here is that Palisades is under more scrutiny because of the recent safety problems. The NRC wants to be more transparent about what’s going on there. So that’s why the agency took this unusual step of releasing preliminary results of its inspection. Rebecca: Thanks Lindsey. Lindsey Smith is Michigan Radio’s west Michigan reporter. 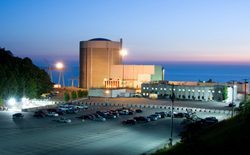 Documents released this week show a Nuclear Regulatory Commission inspector based at Palisades discovered a new leak during a routine inspection on September 20th. Palisades is under more scrutiny this year after a series of problems earned it one of the worst safety ratings in the country. This is at least the third water leak (depending on exactly how you tally them) at the nuclear plant this year. You can find more details about the first leak from a large water tank above the control room here, and the second water leak from the actual reactor here. Palisades sits right next to Lake Michigan near South Haven. It uses water from the lake to help cool equipment. This new leak is from a valve on a pipe that funnels that Lake Michigan water back into the lake. The water is leaking from that valve into a secondary building at the plant. Right now the leak is about a cup and half an hour. The water is not radioactive. But this is just the latest water leak; Palisades shut down twice this year to fix two other separate water leaks. So how many leaks is too many? “We are asking ourselves that question but in a different way, which is; why is this happening? Is there a common thread that we need to look at?” Mitlyng said. A Palisades spokesman says they’ve determined where the leak is coming from. He says the company may repair the “through-wall, pinhole leak,” replace the valve, or change the system of pipes to bypass the valve altogether. It’s unclear when that fix will happen. Mitlyng says this is a good example of how regular NRC inspections do identify issues of concern. View our timeline of problems at Palisades over the past two years. The Michigan Department of Natural Resources has the authority to set aside land to make sure biodiversity is preserved. Basically, that means the DNR can designate an area to protect the variety of plants and animals that live in that place. But new legislation seeks to greatly limit that authority. Senate bill 1276 would prohibit the DNR from setting aside an area of land specifically for the purpose of maintaining biological diversity. The DNR could not make or enforce a rule to do that. Senator Tom Casperson is one of the bill’s sponsors. He says the DNR has too much power to set aside land for the purpose of conservation. Casperson says he gets angry calls from his constituents when they learn, for example, that motorized vehicles are not allowed in certain areas. He says his bill would put more power in the Legislature’s hands. Delete the conservation of biological diversity from the DNR’s duties regarding forest management, and require the Department to balance its management activities with economic values. Environmental groups are reacting as well. Garmon says the DNR does a good job of managing for all kinds of uses – including timber harvest and off road vehicles… and at the same time protecting the state’s rich animal and plant life. And he points out the DNR does ask for public input. He says this bill is the latest in a string of legislation that’s aiming to change the way land is used and managed in Michigan. You can listen to the story above or read an expanded version below. 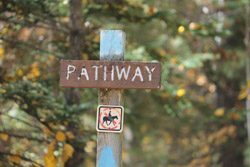 For four months, Enbridge repaired sections of the current pipeline running through the Watson’s backyard. Tom Watson says Enbridge workers brought in lights and worked in their yard with heavy equipment day and night. The Watsons say the work caused cracks in their foundation… and other damage they say they have not been compensated for. 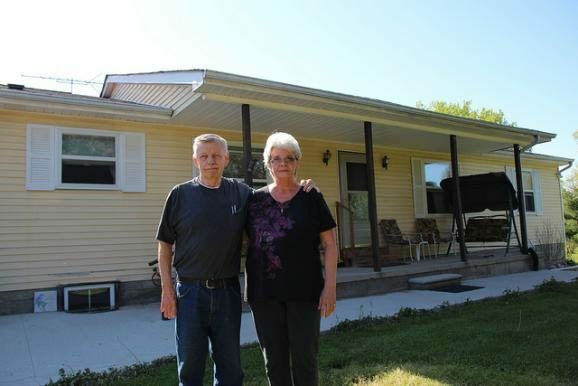 The couple says they were not satisfied with the offers Enbridge made for their land for the new pipeline. Connie Watson says she feels like she’s at the mercy of a company that has acted more like a bully than a responsible corporate neighbor. 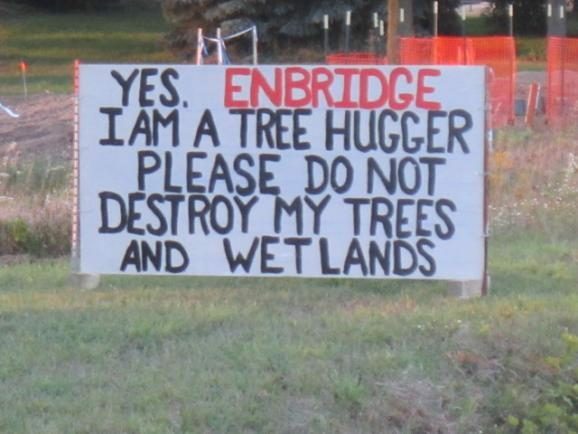 The lawyers for Enbridge declined to comment. The Gannett News Service reports Enbridge has taken more than 70 homeowners in Michigan to court to force them to give up some of their property. Carol Brimhall lives in Stockbridge on 38 acres. But she says they were not satisfied with any offers. 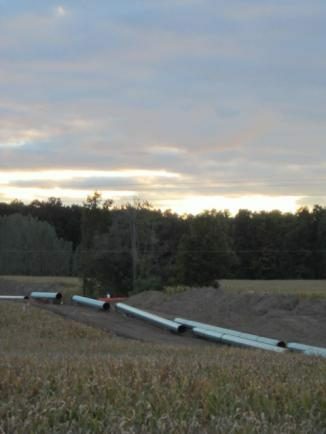 A judge in Ingham County recently ordered that Enbridge could expand its easement on her property. Enbridge now has 25 additional feet of permanent easement and 60 feet beyond that to use as temporary workspace. 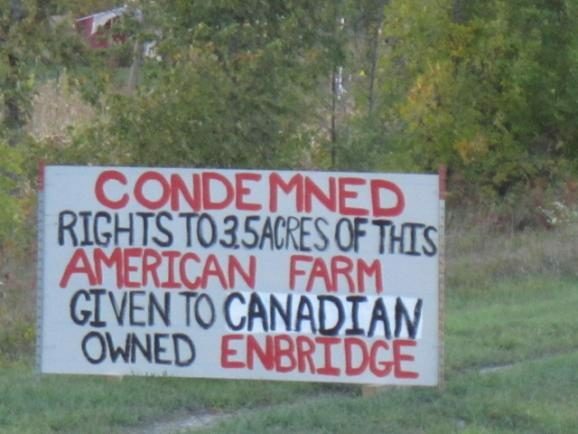 The judge also ordered the Brimhalls to accept around $11,000 dollars in compensation from Enbridge. 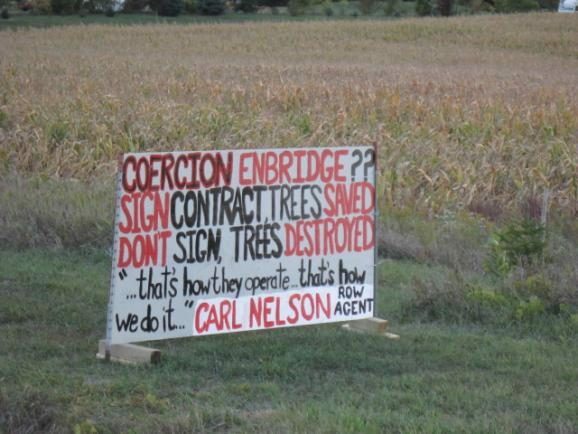 Brimhall says Enbridge crews cut down more than 100 large trees on her property last week. She says the work started the same day her mom was in the hospital, dying. We asked Enbridge Energy to comment for this story. The company did not make anyone available for an interview. 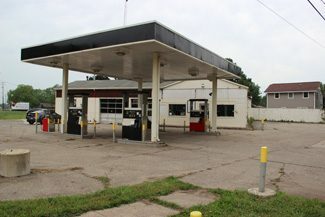 There are around 4,800 gas stations in Michigan, but at one time, there were a lot more. It seemed like just about every corner had a gas station on it. Many of those gas stations are closed now, but taxpayers are often on the hook for what’s been left behind. One morning the owner of Logan’s Gas & Deli came in to check his inventory, and things were a little off. Steve Beukema is with the Michigan Department of Environmental Quality. “In the course of a weekend they lost about 8,000 gallons of gasoline. They came to work on a Monday and their 10,000 gallon tank was empty,” said Beukema. Beukema is the project manager for the clean-up at this site near Battle Creek. He says when they pulled the tank, they found a dime-sized hole on the bottom. Gas spread through the sandy soil underground, across the street, and under a house and a nearby pizza restaurant. Both get their water from underground wells. Beukema says the owner tried to clean up the mess, but the insurance company wasn’t paying the bills fast enough. The clean-up contractor walked away after they weren’t getting paid, and the gas station went belly up. So that’s when you and I step in. We pay an extra fee at the gas pump that helps pay for this kind of clean-up. Beukema showed me their clean-up system. It uses a series of high pressure valves that force air underground. The air pushes the gas vapor upward. Altogether this clean-up will cost more than a million dollars. Luckily, the underground drinking water wells were not affected here. This site is an extreme case. Beukema says most leaks at gas stations don’t happen so quickly. They typically leak slowly – over long periods of time. These kinds of slow underground leaks have affected drinking water supplies and surface water, and there have been a lot of leaks in Michigan. Today, there are more than 9,000 documented leaks that still need to be cleaned up. Most of these tanks are not actively leaking, but the pollution remains. In the U.S., only Florida has more open clean-up cases. Around half of the 9,000 sites in Michigan are known as “orphan” sites. The original polluters can’t be found, or they can’t or won’t pay for them. So it falls back to the state, but the state has been lagging behind with clean-ups. Mark Griffin is with the Michigan Petroleum Association. “You could not find a more inefficient, stupid way to run a clean-up program,” said Griffin. He blames a lot of bureaucratic red tape and a lack of funding for slowing down the clean-ups. That fund was originally set up to help clean-up leaks when gas stations replaced their underground tanks, but with the recent tight budget years, that fund has been raided for other purposes. “I believe $10-15 million a year during the Granholm administration was siphoned off to the Department of Treasury to pay quality of life bonds,” said Griffin. And the fund is still being diverted under the Snyder Administration. The 7/8 of a cent that we pay on each gallon of gas generates around $50 million a year for the Refined Petroleum Fund. This summer, the legislature passed a series of bills aimed removing a lot of the red tape in the clean-up program. It will also set up an advisory board to take a look at how the money in the Refined Petroleum Fund is spent. The state estimates it would cost around $1.8 billion to clean up the more than 9,000 contaminated sites around the state, so even if all the gas fee money went towards clean up. It would take decades to tackle the backlog.